Classic city weddings always have our hearts. 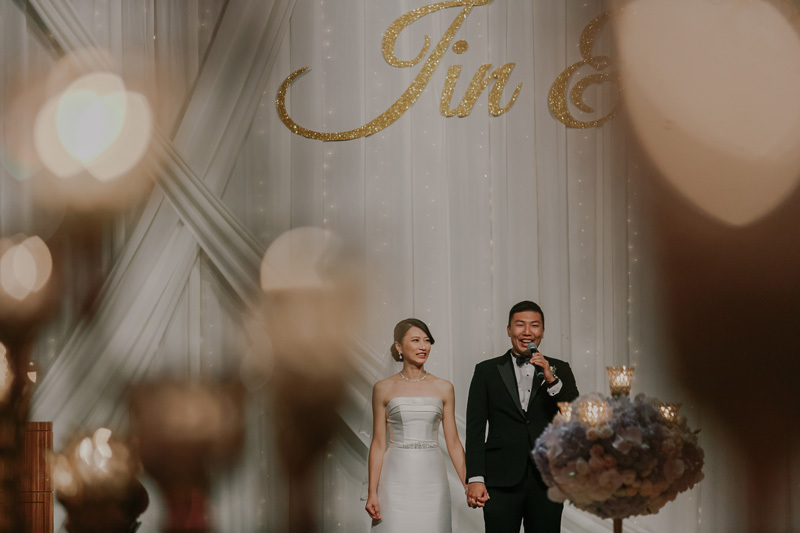 And when they’re as glamorous as Wee Jin and Shanru’s wedding reception held at the Grand Hyatt Kuala Lumpur, well… let’s take a look the beautiful photos Louis Loo captured that evening! 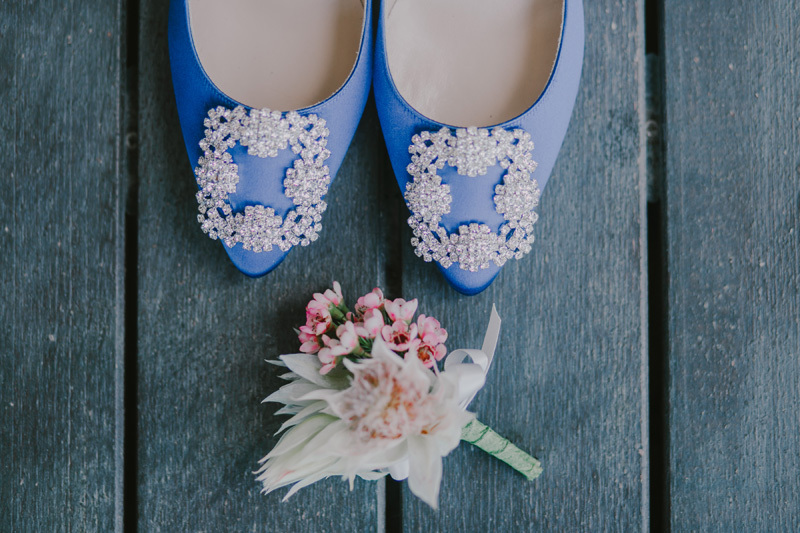 Something blue, our bride’s favourite colour. 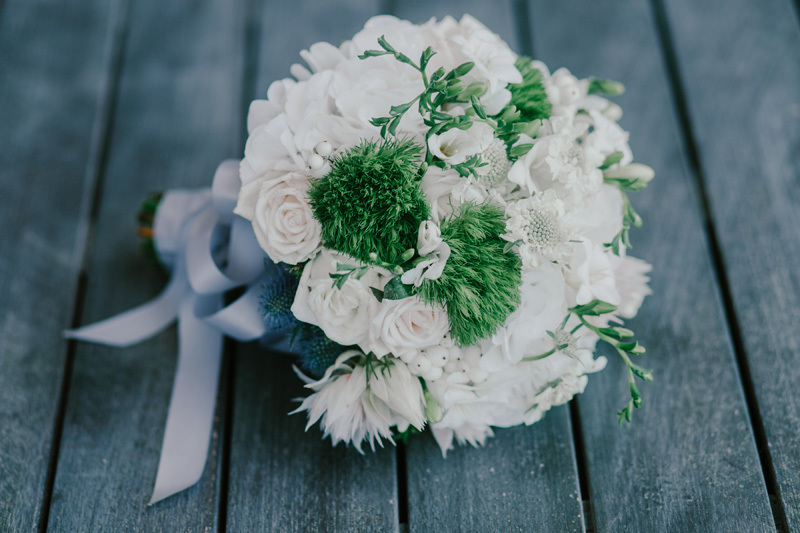 We created a simple bridal bouquet for beautiful Shanru, who wanted some green in it. The only place where pinks were allowed! As our couple met in London as college students, they wanted their wedding decor to have “elements related to something British”. A hint of “British vintage” then! 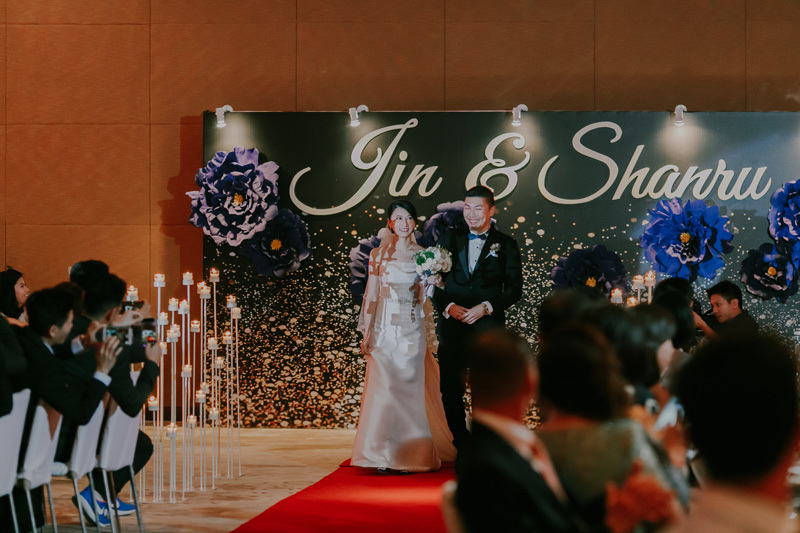 When Wee Jin and Shanru came to us on Grand Hyatt’s recommendation, we had a total of six weeks to prepare for this wedding reception. You read right, six weeks! Shanru was in Taiwan preparing her side’s pre-wedding dinner, which meant she was away for half the time. No matter, we’re good at taking down clear instructions. 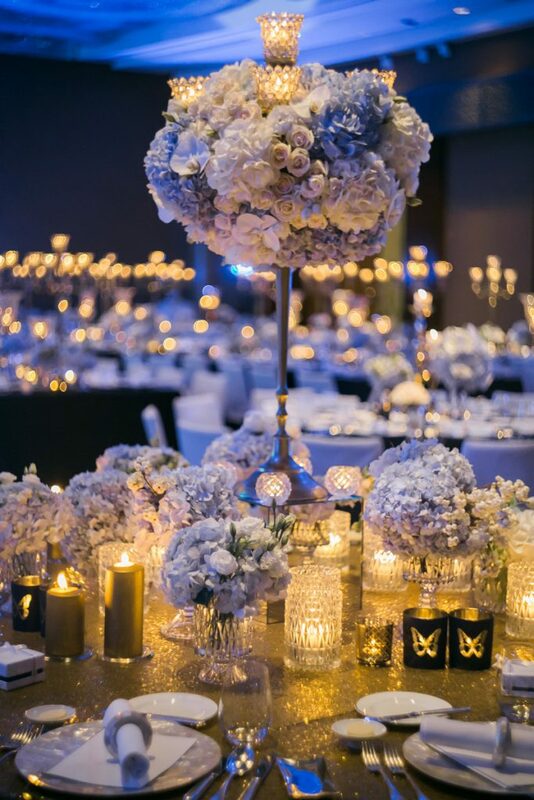 So, for this even at the Grand Hyatt – a Western-style decor, simple and elegant, blue hydrangeas, no pink, red or purple flowers. Handmade flowers adorn a customized entryway installment. 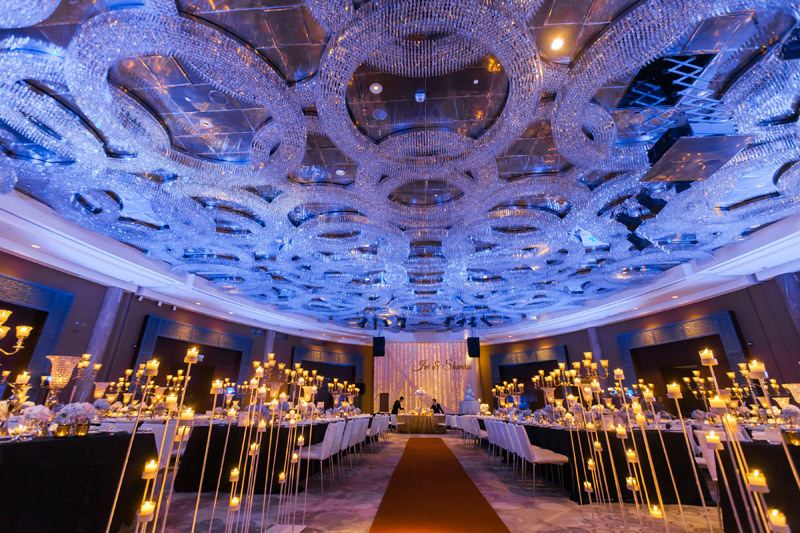 The Grand Hyatt ballroom is aglow for a little evening romance. 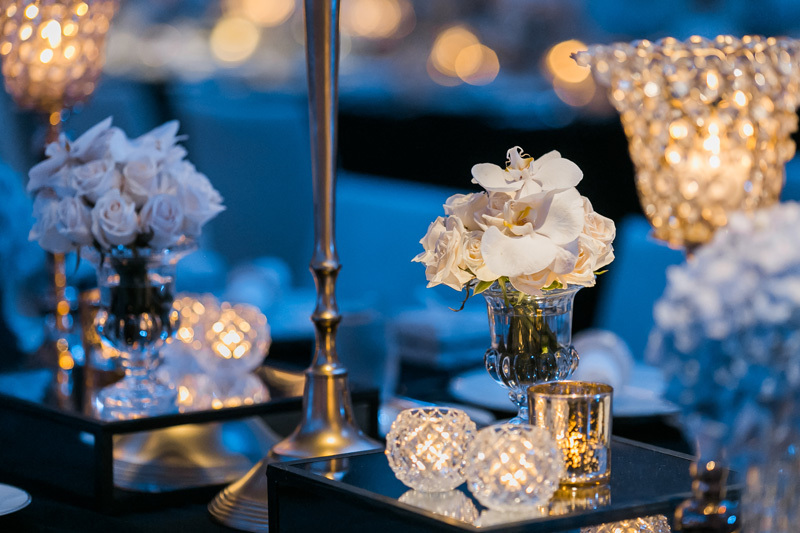 Our couple liked a black and ritzy gold palette and a tablescape that wasn’t overly complicated, so we created this look for them. The bridal table’s centerpiece makes a subtle statement with gentle textures. A closer look at the centerpiece. The dainty details that help to make a statement. 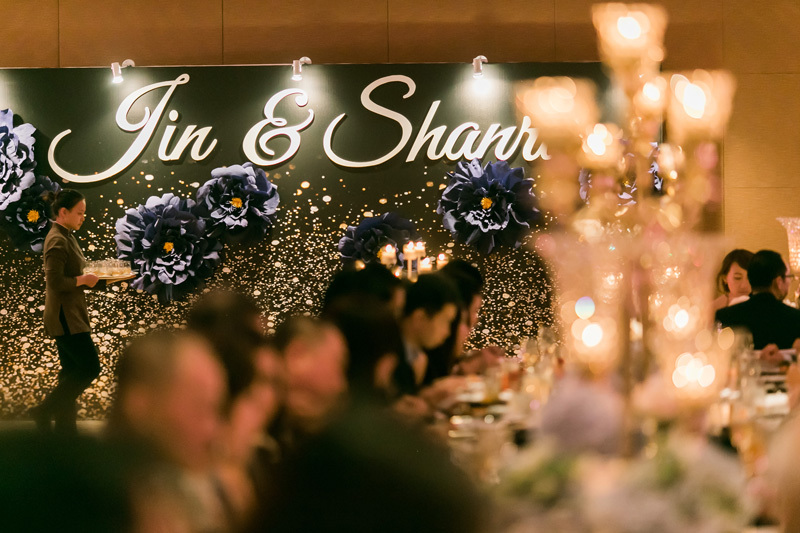 Instead of traditionally using all round tables, Wee Jin and Shanru chose to use long tables as well. 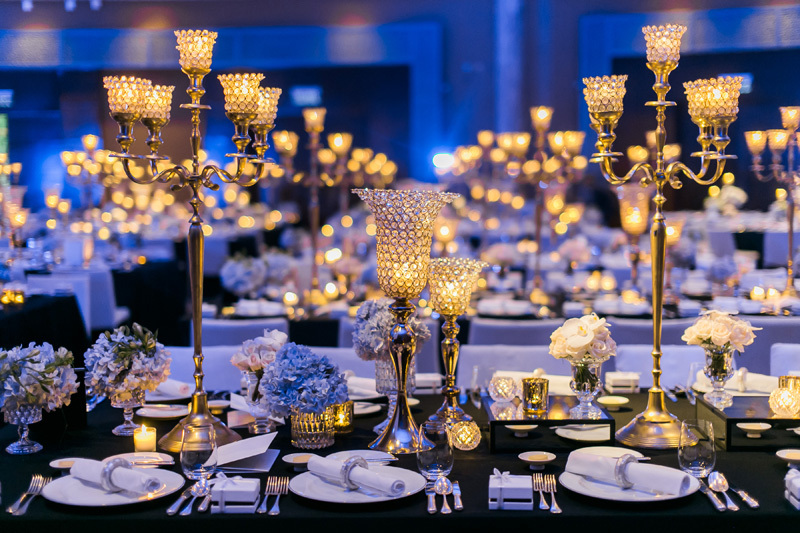 “The long tables draped in black, with the gold candelabras, crystal vases, and gold candles represented the theme we wanted and even created an unexpected fairytale atmosphere,” says Shanru. The centerpiece along the viking tables use the same elements from the bridal table. Small in size, but big on sparkles and textures. Centerpiece for the round tables. Jin and Shanru make their way to the bridal table. 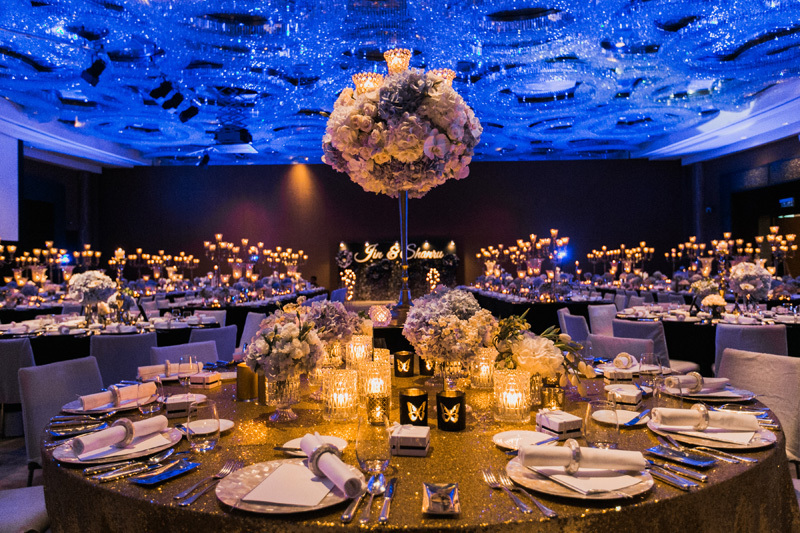 Jin and Shanru’s guests enjoy a sumptuous dinner in an intimate, romantic setting. 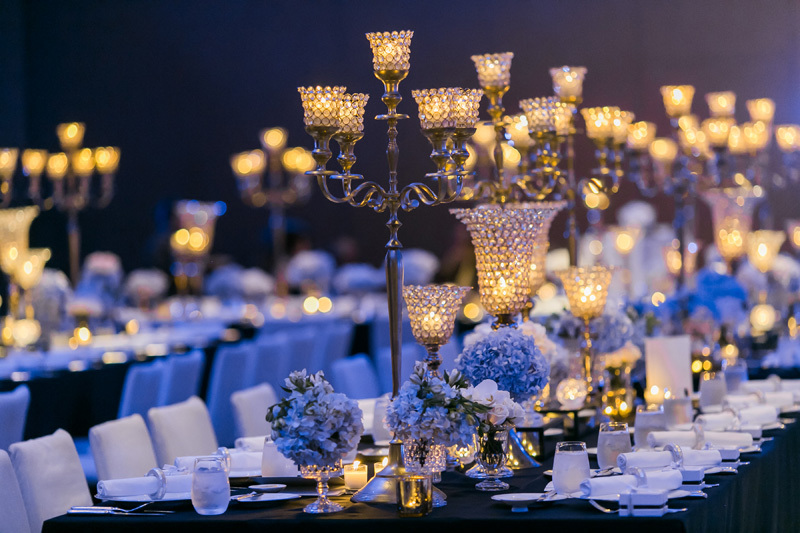 You can never go wrong with fairy lights and sheer linens. 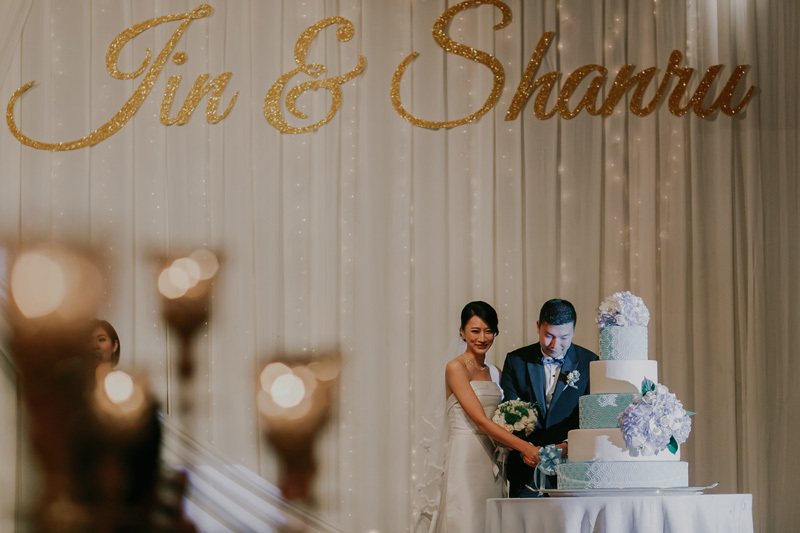 Jin and Shanru cut their wedding cake – in Shanru’s favourite pastel blue and white. Six weeks is a pretty short time to put together a wedding, but we’re so glad to have pulled this off together with you. 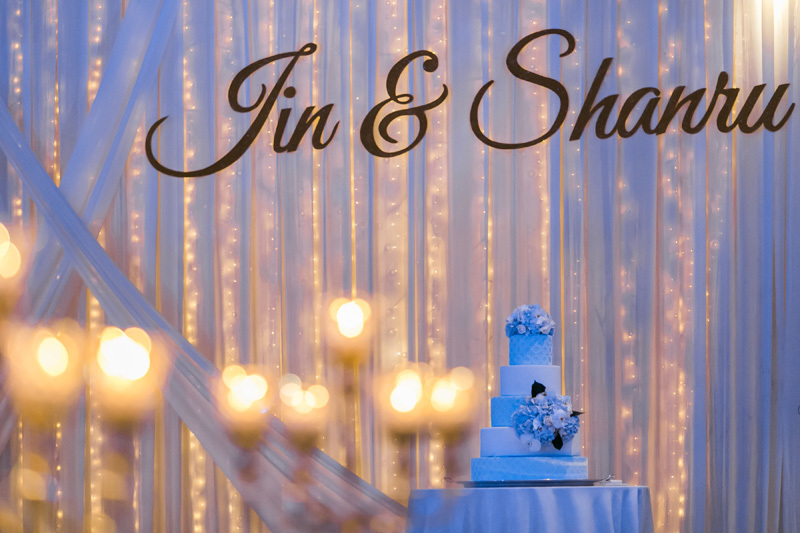 Thank you so much dear Jin and Shanru for sharing your wedding day with us, and with our readers! Our wonderful couple, who we wish a lifetime of joy, laughter, and love! 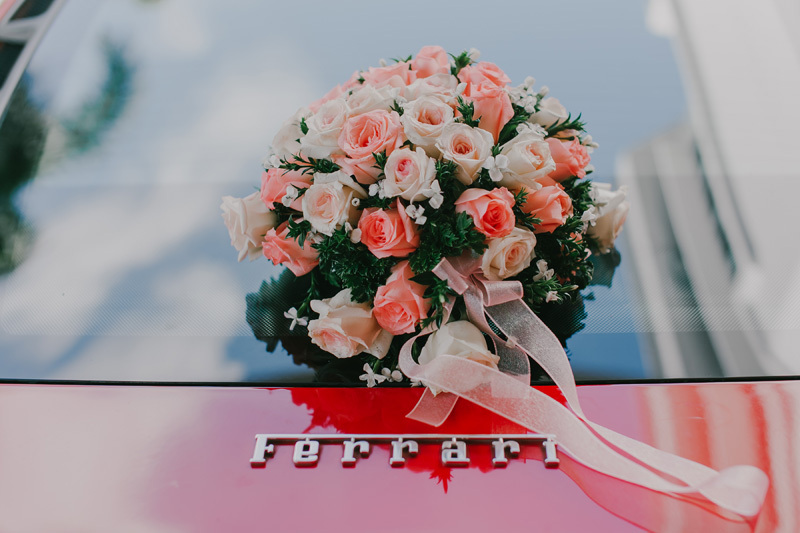 “Wishing Tree is a decor company that thinks ahead of their customers and always gives their customers more choices and advice since they have countless experience in decorating the events and weddings. 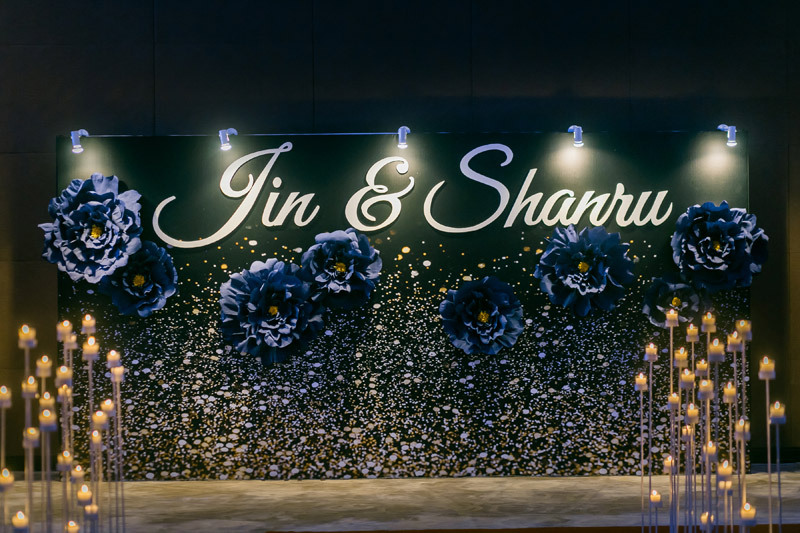 When I told Lily I wanted blue and white for the wedding, she reminded me these two colours may not be popular in the Chinese culture especially to elderly, so she used ivory roses instead of using all white flowers. 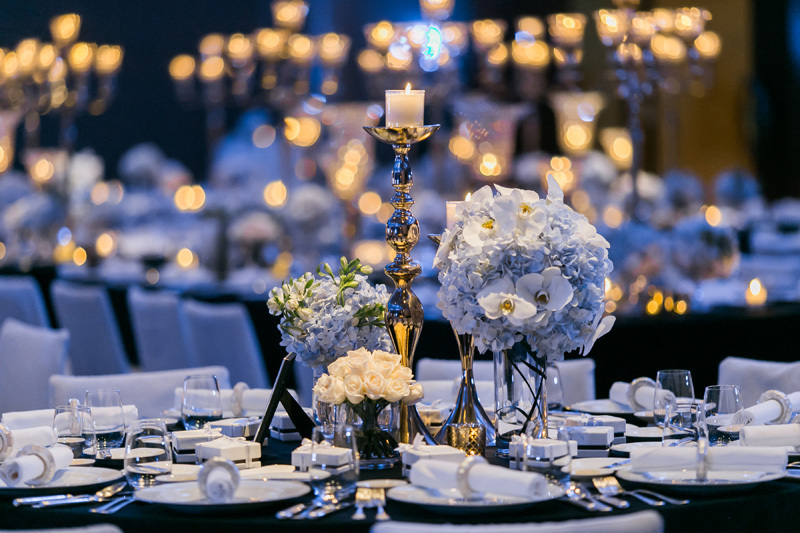 We loved the black table linens throughout the ballroom, but to ensure the main table would stand out from the rest, she covered ours with a shimmer tablecloth. “Wishing Tree is a super efficient company. Lily, she replies very quickly, which is something I’ve never quite experienced in Malaysia (please forgive me as I used to live in Hong Kong so I think people here are a bit more relaxed).